Who should stress test the stress-testers? Kevin Dowd has recently published an expanded and provocative critique of central bank stress testing via the Adam Smith Institute. It is based on a 2014 piece for the Cato Institute. Dowd makes many excellent points that highlight the terrifying challenge of adequately supervising systemically risky giant banks. One should also remember that much market instability arises from the erratic monetary policies of the Federal Reserve itself. These policies are illustrated in Figure 1, which shows the Fed funds rate since the 1950s. By my count, there are 10 notable interest rate peaks. All but one—that of the mid ’90s—were followed by sharp falls. Among the highlights were the massive, necessary-but-painful Volcker interest rate hike starting October 1979, which left much of the banking system insolvent in the early 1980s; the doubling of interest rates over 1994, which led to a wave of defaults (Orange County, etc. ); Greenspan’s warnings of “irrational exuberance” in 1996 followed by monetary easing, which stoked the tech bubble that burst in 2001; and after interest rates peaked again, another major volte-face occured, in which interest rates became negative in real terms and stoked the subprime mortgage market. By 2007, interest rates had climbed again to just over 5 percent, but they were brought down to virtually zero in 2009 and have remained there since, well below inflation for nearly six years. If the past is anything to go by, these rates are stoking the mother of all booms and the mother of all busts as well. So, on the one hand, the Fed endorses—in fact, requires—the use of risk models, but on the other, it undermines them by its own erratic monetary policies: the models cannot pick up the Fed’s sharp and unpredictable twists and turns. In fact, even the Fed itself can’t predict its own erratic twists and turns … it is the Fed that ultimately drives interest rates through its control of the money press, and the market merely reacts: the instability that everyone feared was created by the Fed itself. While this is a somewhat populist précis of monetary policy over the last sixty years it does imply a critical question. How can the Fed be responsible for supervising the banks when its monetary policy is so often the cause of the problems of the banks? And with the Market Monetarist interpretation of the Great Recession, or with a banking hat on, the Global Financial Crisis, this critique really is the key challenge to stress testing. The central banks turned a housing boom that was largely correcting itself into both a housing bust and a generalised economic crisis through not responding at all to the economic slowdown that the housing correction was engendering. In fact, not only did they not respond they either steered the market to expect rises in interest rates or even raised rates (the ECB). They did this because of their fixation on headline inflation, based on their clinging on to an outdated Inflation Targeting regime. The central bankers in the UK at least were also concerned about the moral hazard of lowering rates, or even providing emergency funding, “just to bail out the banks” from their liquidity challenges. Liquidity challenges that arose directly from tightening monetary policy increasing the demand for money and taking it away from funding banks’ housing loans. This insanely dangerous confusion of the role of monetary policy in promoting financial discipline led directly to the collapse of Northern Rock in September 2007, followed by numerous other UK domestic banks during 2008 and into 2009. Other central banks responded much more swiftly to these changes and avoided the catastrophe of bank runs. Yes, the Basel 2 reforms had allowed and even encouraged much higher levels of bank leverage and a massively over-optimistic view of the reliability of financial modelling. But what the modelling could never really have included was the possibility of catastrophic monetary mismanagement. What reputable central banker would have signed off on bank models that included such ridiculous scenarios as central bank incompetence? The Catch 22 issue is that banking regulation and monetary management are broadly in the hands of the same authority. And the monetary authorities cannot bring themselves to admit their own failures or the instability they cause and, hence, cannot bring it into the stress tests that they use on the banks. A first step towards the adequate supervision of the banks has to be a recognition of the central banks’ responsibilty for the GFC. And then set the supervisors to build that narrative into their stress tests. Note: To many, James Alexander will be known as “James in London”, a frequent commenter on a number of MM blogs. One point of this series of posts (see list at the end) was to show that during the US age of zero interest rate policy (ZIRP) from December 2008 through May 2015, using nothing more complicated than a simple conventional Vector Auto-Regression (VAR) model with a minimum of structure, the monetary base has had statistically significant effects on the goods and services markets through broad spectrum of financial market variables. 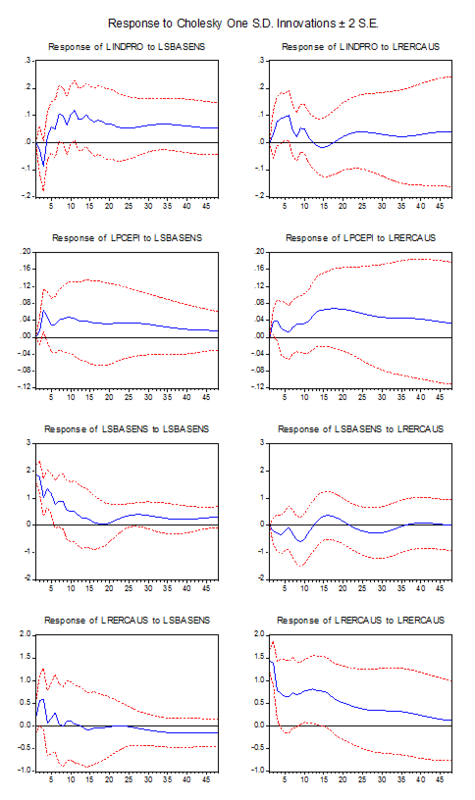 The other is that we now have a baseline VAR model that can be used for further policy analysis, and which can be improved in the future through the use of different impulse response identification structures, or perhaps more advanced estimation methods. The monetary base is unique among monetary aggregates in that the central bank has the ability to decide precisely how large it will be at any given moment. Even the amount of bank reserves, which along with currency in circulation is a component of the monetary base, cannot be determined with any precision by the central bank, since it is a residual of the amount of currency in circulation, which is itself determined by the depositors’ desire to hold currency. The only other variable which the central bank can arguably target with such precision is the overnight interbank lending rate, which is itself largely determined by the size of the monetary base through the conduct of open market operations. Thus, if one is interested in studying the effects of monetary policy at the zero lower bound in short term interest rates, the monetary base is the logical variable to represent the instrument of monetary policy. The fact that, away from the zero lower bound, the usual instrument of monetary policy, namely the overnight interbank lending rate, is itself essentially determined by the size of the monetary base, means that this change in instrument during the age of zero interest rate policy (ZIRP) is less meaningful than many may realize. And, it is worth noting, any monetary economics model that uses as its primary monetary variable one which cannot be easily controlled by the central bank is, quite simply, useless for studying the effects of monetary policy. In each of these posts I have discussed in detail the types of diagnostics that I have conducted in fitting the model to the data. The reason for this is two-fold. One is that I wanted these posts, as technical as they may at times seem to be, to be highly accessible. That is, I want these results to be easily reproducible by anyone who has the time series econometric background and access to commonly used econometric software packages such as EViews, Stata, SAS, R, Gretl, etc. If I am doing anything at all novel here, it is to as much as possible enable others to verify these results for themselves. Second, without proper model specification, the obtained results almost certainly will be statistically biased, meaning that the reported statistical significance of the results, if any, will be highly questionable. And if a time series model’s results are reported without routine references their statistical significance, then they should always be viewed with deep skepticism. The three most important channels of money transmission that I didn’t directly address in this series of posts are 1) the Traditional Real Interest Rate Effects Channel, 2) the excess bank reserve channel of the Bank Lending Channel, and 3) the Cash Flow Channel. According to the Traditional Real Interest Rate Effects Channel, reductions in the expected long-term real interest rate lead to increased expenditures on physical investment and durable goods. My own estimates indicate that during the age of zero interest rate policy (ZIRP) there is no correlation between expected long-term real interest rates (as measured by the 10-Year Treasury Inflation-Indexed Security) and industrial production or the price level. Moreover there’s no correlation between the monetary base and expected long-term real interest rates. According to the excess bank reserves channel of the Bank Lending Channel, a rise in excess reserves leads to an increase in bank lending. My own estimates indicate that there is in fact a correlation between excess bank reserves and bank credit, but that this correlation is hard to disentangle from the other channels through which changes in the monetary basis appear to be influence bank credit, namely the balance sheet channel and the household liquidity effects channel. Moreover, I am skeptical that an increase in bank reserves would have much of a marginal effect on the amount of bank credit. In any case, regardless of how changes to the monetary base are influencing the amount of bank credit, the effect is statistically significant. The more important problem is of course that the level of bank credit does not have a statistically significant effect on output or prices. According to the Cash Flow Channel, reductions in nominal interest rates lead to increase the liquidity of debtor households and firms at the expense of creditor households and firms. The interest rate that is most representative of this effect is the 10-Year Treasury Security yield. As we saw in the post on the Bond Yield Channel, positive shocks to the monetary base lead to increases in the 10-Year Treasury Security yield, the opposite of what the effect of expansionary monetary policy is theorized to be under the Cash Flow Channel. Furthermore, increases in the 10-Year Treasury Security yield lead to increases in industrial production, the opposite effect of what is implicitly theorized under the Cash Flow Channel. Is there reason to believe that these three channels of monetary transmission work away from the zero lower bound in short term interest rates? The short answer is no. Many researchers, including Bernanke and Gertler (1995), believe that empirical evidence does not support strong interest rate effects operating through the cost of physical capital, as is theorized under the Traditional Real Interest Rate Effects Channel. My own estimates from during times when the US economy has been away from the zero lower bound in short-term interest rates show that while there is a correlation between the ex-post real (i.e. adjusted by the year on year PCEPI) 10-Year Treasury Security yield and private nonresidential investment and private residential investment, there is no correlation with durable goods spending. More importantly, I find that higher real interest rates lead to higher physical investment spending, not lower. That only really makes sense in a model that acknowledges the role of money in determining interest rates. As for the excess bank reserves channel, several studies have shown that during times when the central bank is targeting the overnight interbank interest rate as its instrument of monetary policy, bank credit usually Granger causes the monetary base. This is often misinterpreted by endogenous money enthusiasts as meaning that the actions of the central bank are constrained by the demand for bank credit. The reality is that when the central bank targets an interest rate, the level of bank credit and the monetary base (and practically everything in the economy for that matter) are endogenous to the central bank’s interest rate target. The reason why I bring this up however is that away from the zero lower bound in short term interest rates there is little reason to believe that it is the level of excess bank reserves that is determining the level of bank credit. Rather, it is the central bank’s interest rate target that is ultimately determining the level of bank credit. And finally, as weak as the empirical evidence is for the theorized workings of the Cash Flow Channel during the age of ZIRP, it is even weaker during the times when the US economy has been away from the zero lower bound in short-term interest rates. Anyone who has taken note of the yield curve’s obvious predictive power for business cycles knows that the correlation between nominal long term-rates and aggregate nominal spending must be the opposite of what is theorized under the Cash Flow Channel. Whither the Role of Interest Rates? In most of these posts I was able to generate statistically significant monetary policy effects without any reference at all to an interest rate as the instrument of monetary policy. The only exception was in the posts on the Exchange Rate Channel where I found it necessary to include the overnight interbank interest rate owing to the fact that most major US trading partners have been targeting that rate as the instrument of monetary policy during the age of US ZIRP, and the real exchange rate is determined not only by the monetary policy of the domestic country, but also by the foreign trade partner. However, as we have just discussed, the empirical evidence does not support the Traditional Real Interest Rate Channel, and the empirical evidence flatly contradicts the supposed workings of the Cash Flow Channel, and these two are the only other monetary transmission channels that rely at all on interest rates. Thus we are left with the realization that interest rates are only important to the extent that they are targeted by the central bank, and even then their importance seems to be primarily stemming from what it indicates about what is happening to the monetary base. Does the Liquidity Trap Exist? Modern applied macroeconomic models of the liquidity trap usually rely on some version of the David Romer’s ISLM/ISMP model. If expected short-term real interest rates cannot be lowered to a level prescribed by some version of a Taylor Rule, the only way to increase real output is by increasing inflation expectations. This is because the central bank can only determine the level of real output through changes in the expected short-term real interest rate. But as we have seen here there is really is no monetary transmission channel that works primarily, much less exclusively, through expected short-term interest rates. Thus any model that relies on the supposed inability of the central bank to lower expected short-term interest rates to demonstrate the ineffectiveness of monetary policy is guilty of assuming its conclusion. Central banks usually target short term interest rates as an instrument of monetary policy not because there is any credible mechanism by which they directly and significantly impact the economy, but because 1) they are quickly and accurately measurable, 2) the central bank can exercise a great deal of control over them, and 3) because changes in them usually lead to reasonably predictable outcomes in terms of policy goals. These qualities may make short term interest rates convenient as an instrument of monetary policy away from the zero lower bound, but they should in no way cause us to confuse short-term interest rates for the actual mechanisms by which monetary policy is transmitted. Are There Other Reasons to Believe in the Liquidity Trap? The most popular way to “prove” the existence of the liquidity trap is to simply point at a graph of the monetary base of a country in ZIRP (and/or the velocity of the monetary base) and then profoundly intone, “see?” But all this really shows is that the velocity of the monetary base is a variable, something which every applied macroeconomist already knows. And an argument consisting of little more than a line graph depicting the time series of values of a quantity should never be accepted as a proof of anything, except that the person who is arguing that it proves something is not familiar with what constitutes acceptable empirical evidence, is incapable of understanding what constitutes acceptable empirical evidence, or is simply willfully ignoring what constitutes acceptable empirical evidence because it contradicts their preferred model. Et Tu Singapore? Another Central Bank Suffocates An Economy? Singapore is every economist’s favorite nation, for its often free-market or price-sensitive approach to government. And the city-state has boomed for generations, verifying economists are right. But now, reports The Economist in its July 18 issue, Singapore’s productivity is dying on the vine, much like that of the United States, or Europe. “Productivity grew at an annual average of 5.25% in the 1980s and 3.1% in the 1990s, but just 1.8% in the 2000s,” reports the magazine. It gets worse: In 2014, output per hour fell by 0.8% in Singapore. This is dark news: Underpinning much Western commentary is that structural impediments, not monetary policies, are slowing productivity gains. Moreover, government data released last week shows the Singapore economy shrank in Q2. Gee, is a villain entering the picture? Of course, managing exchange rates is a little different from targeting inflation. If Singapore’s trading neighbors go heavy into printing money, then it would have to also, to maintain exchange rates (ceteris paribus). But, if trading partners put on the monetary noose…. “CPI-All Items inflation edged up to -0.4% in May, from -0.5% in April, on account of the higher cost of private road transport,” the Singapore’s central bank says in its latest monthly report. Bluntly put, Singapore is having deflation. Then, yesterday, the MAS said it expects inflation in 2015 in the “lower half” of an expected 0.5% to 1.5% range. In other words, microscopic, within measuring error of zero, or even deflation. To be sure, unemployment is under 2% in Singapore. But then, unemployment is also very low in Thailand and Japan, without inflationary pressures. And in the United States, the Phillips Curve has become prone—where anymore is the connection between “tight” labor markets and inflation? Obviously, this blog post not a thorough study of Singapore. And cross-country comparisons are hazardous, due to differences in the collection of data. But few have damned Singapore for a rising tide of structural impediments or taxes in recent years. Yet Singapore productivity is falling, its economy in Q2 shrank, and despite invisible rates of inflation and present-day deflation, the central bank pettifogs about wage pressures. It sounds familiar, no? The MAS is sending a powerful signal, akin to the Fed: No matter how tight money is, we can make it tighter. As I have posted many times, somewhere in the last 10 to 20 years, central bankers and their allies have become peevishly fixated on infinitesimal rates of inflation, a cult has evidently metastasizing from the Bank of International Settlements and other money-obsessed redoubts. Gone is the Milton Friedman who in 1992 wrote for The Wall Street Journal, “It is hard to escape the conclusion that the restrictive monetary policy of the Federal Reserve deserves much of the blame for the slow, and interrupted, recovery from the 1990 recession.” Inflation in the U.S. was then about 3%. Today, Friedman’s statements are heresy among central bankers. Even in long-admired Singapore, a city-state with a future perhaps dimmed by a yet another central bank. In this post we are going to add a measure of US bank credit to the baseline VAR which I developed in these three posts. (1, 2 and 3). In particular, we are going to add Bank Credit at All Commercial Banks (LOANINV). The first thing I want to do is to demonstrate that the monetary base Granger causes bank credit during the period from December 2008 through May 2015. 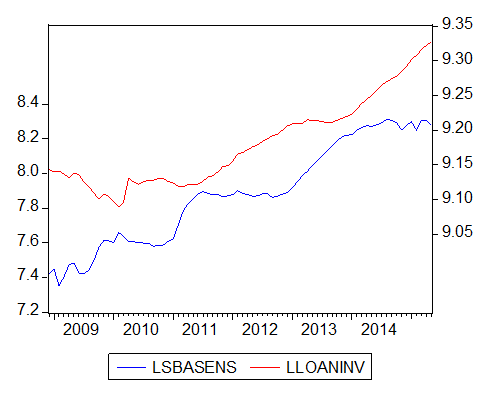 Here is a graph of the natural log of SBASENS and LOANINV. Using the Augmented Dickey-Fuller (ADF) and Kwiatkowski-Phillips-Schmidt-Shin (KPSS) tests I find that the order of integration is one for both series. I set up a two-equation VAR in the log levels of the data including an intercept for each equation. Most information criteria suggest a maximum lag length of four. An LM test suggests that there is no problem with serial correlation at this lag length. The AR roots table suggests that the VAR is dynamically unstable at this lag length, and increasing the lag length does not seem to fix the issue. This would be a problem if our primary objective in estimating the bivariate VAR was look at its impulse response functions (IRFs). Fortunately, the Granger causality test results do not rely on the bivariate VAR being dynamically stable. Finally, the Johansen’s Trace Test and Maximum Eigenvalue Test both indicate that the two series are cointegrated at this lag length. This suggests that there must be Granger causality in at least one direction between the monetary base and bank credit. 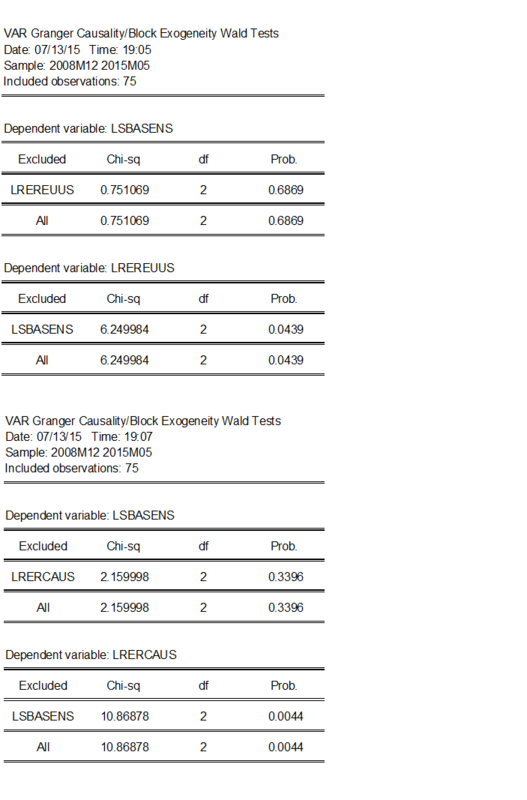 Then I re-estimated the level VAR with one extra lag of each variable in each equation. But rather than declare the lag interval for the two endogenous variables to be from 1 to 5, I left the intervals at 1 to 4 and declared the lag of each variable to be exogenous variables. Here are the Granger causality test results. Thus I fail to reject the null hypothesis that bank credit does not Granger cause the monetary base, but I reject the null hypothesis that the monetary base does not Granger cause bank credit at the 5% significance level. In other words there is evidence that the monetary base Granger causes bank credit, but not the other way around. Since the monetary base Granger causes bank credit, it should probably be added to our baseline VAR model. This is because, under these circumstances, we might expect shocks to the monetary base in the VAR model to lead to statistically significant changes in bank credit. With the bank credit added to the baseline VAR model, most information criteria suggest a maximum lag length of four. An LM test suggests that there is no problem with serial correlation at this lag length. An AR roots table shows the four-variable VAR to be dynamically stable. The Johansen’s Trace Test and Maximum Eigenvalue Test both indicate that there exists two cointegrating equations at this lag length. But this is expected, since we already have evidence that the monetary base is cointegrated with both industrial production and bank credit. This matter is addressed in greater detail in the three posts where the baseline VAR is developed. I am using a recursive identification strategy (Choleskey decomposition), which is the dominant practice in the empirical literature on the transmission of monetary policy shocks. Such a strategy means that the order of the variables affects the results. For the four-variable VARs I am arranging the output level first, the price level second, the monetary policy instrument third, and the financial variable last in the vector. This ordering assumes that the Federal Open Market Committee (FOMC) sees the current output level and price level when it sets the policy instrument, and that the output level and price level respond to a policy shock with one lag, but that financial markets respond to a policy shock with no lag. As before, the response standard errors I will show are analytic, since Monte Carlo standard errors change each time an Impulse Response Function (IRF) is generated. Here are the responses to the monetary base and to bank credit in the four-variable VAR. The instantaneous response of bank credit to a positive shock to the monetary base is negative, but it is relatively small and is statistically insignificant. This is followed by a statistically significant positive response in months 11 through 18. However, a positive shock to bank credit does not lead to a statistically significant response in either the level of industrial production or the price level in any month. The IRFs show that a positive 2.2% shock to the monetary base in month one leads to a peak increase in bank credit of 0.32% in month 14. So why might an increase in the monetary base lead to an increase in bank credit? A positive shock to the monetary base raises Nominal GDP (NGDP) expectations, which as we saw in this post, leads to higher stock prices. Higher stock prices raise the net worth of firms, which lowers the perception of adverse selection and moral hazard problems, which makes it more likely that banks will lend for physical investment spending. This so-called balance sheet channel has been amply described in surveys by Bernanke and Gertler (1995), Cecchetti (1995), and Hubbard (1995). The firm balance sheet channel has its counterpart in the household liquidity effects channel. When stock prices rise, the value of financial assets rise, and consumer borrowing for durable expenditures rise because consumers have a more secure financial position and decreased expectations of suffering financial distress. The household liquidity effects channel was found to be an important factor by Mishkin (1978) during the Great Depression. But why hasn’t the positive response of bank credit to positive shocks to the monetary base had a statistically significant affect on the level of industrial production or the price level during the age of zero interest rate policy (ZIRP)? One possibility is that the financial crisis rendered the bank lending channel less effective than it otherwise would be. But a more likely possibility is simply that nominal spending causes nominal lending, and not the other way around. Thus the response of the output level and the price level to increased NGDP expectations would be the same regardless of the level of bank lending. In my next post I will discuss the main conclusions and implications of this series. In this post we are going to add a measure of US bank deposits to the baseline VAR which I developed in these three posts. (1, 2 and 3). In particular, we are going to add Deposits, All Commercial Banks (DPSACBM027SBOG). The first thing I want to do is to demonstrate that the monetary base Granger causes bank deposits during the period from December 2008 through May 2015. Here is a graph of the natural log of SBASENS and DPSACBM027SBOG. Most information criteria suggest a maximum lag length of two. An LM test suggests that there is no problem with serial correlation at this lag length. The AR roots table suggests that the VAR is dynamically stable, and the Johansen’s Trace Test and Maximum Eigenvalue Test both indicate that the two series are not cointegrated at this lag length. Then I re-estimated the level VAR with one extra lag of each variable in each equation. But rather than declare the lag interval for the two endogenous variables to be from 1 to 3, I left the intervals at 1 to 2 and declared the lag of each variable to be exogenous variables. 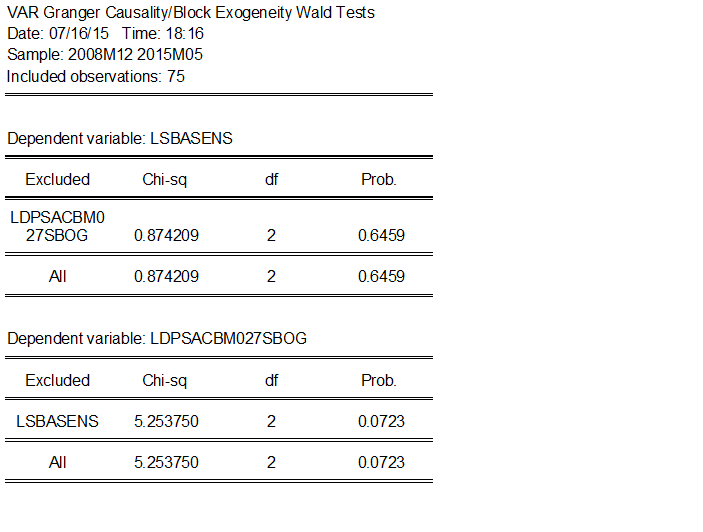 Here are the Granger causality test results. Thus I fail to reject the null hypothesis that bank deposits do not Granger cause the monetary base, but I reject the null hypothesis that the monetary base does not Granger cause bank deposits at the 10% significance level. In other words there is evidence that the monetary base Granger causes bank deposits, but not the other way around. Since the monetary base Granger causes bank deposits, it should probably be added to our baseline VAR model. This is because, under these circumstances, we might expect shocks to the monetary base in the VAR model to lead to statistically significant changes in bank deposits. With the bank deposits added to the baseline VAR model, most information criteria suggest a maximum lag length of two. An LM test suggests that there is a problem with serial correlation at this lag length, but this problem disappears when the lag length is increased to four. An AR roots table shows the VAR to be dynamically stable. The Johansen’s Trace Test indicates that there exists two cointegrating equations, and the Maximum Eigenvalue Test indicates that there exists one cointegrating equation at this lag length. In any case, this is expected, since we already have evidence that the monetary base is cointegrated with industrial production. This matter is addressed in greater detail in the three posts where the baseline VAR is developed. 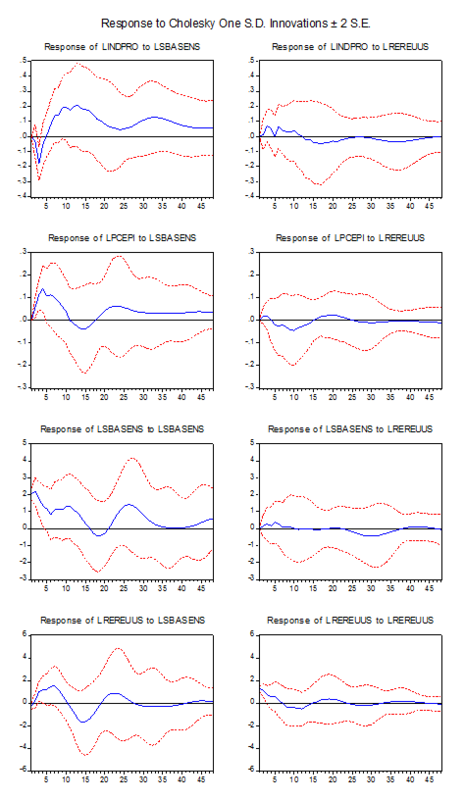 I am using a recursive identification strategy (Cholesky decomposition), which is the dominant practice in the empirical literature on the transmission of monetary policy shocks. Such a strategy means that the order of the variables affects the results. For the four-variable VARs I am arranging the output level first, the price level second, the monetary policy instrument third, and the financial variable last in the vector. This ordering assumes that the Federal Open Market Committee (FOMC) sees the current output level and price level when it sets the policy instrument, and that the output level and price level respond to a policy shock with one lag, but that financial markets respond to a policy shock with no lag. As before, the response standard errors I will show are analytic, since Monte Carlo standard errors change each time an Impulse Response Function (IRF) is generated. Here are the responses to the monetary base and to bank deposits in the four-variable VAR. The instantaneous response of bank deposits to a positive shock to the monetary base is positive, but statistically insignificant. This is followed by a statistically significant positive response in months two and three. However, a positive shock to bank deposits does not lead to a statistically significant response in either the level of industrial production or the price level in any month. The IRFs show that a positive 2.2% shock to the monetary base in month one leads to a peak increase in bank deposits of 0.24% in month three. So why might an increase in the monetary base lead to an increase in bank deposits? If the Federal Reserve purchases a Treasury or an Agency security from a nonbank, the money received by the nonbank is either deposited into a bank or it is retained as currency. Since banks have nearly consistently increased their holdings of Treasury and Agency securities throughout this time period, purchases of Treasury and Agency securities by the Federal Reserve have probably mostly ended up adding to the amount of bank deposits. Why hasn’t the increase in bank deposits led to a more statistically significant increase in the level of industrial production or the price level during the age of zero interest rate policy (ZIRP)? I’m not sure, but it certainly is a challenge for those who believe that broad money has more explanatory power than the monetary base. In my next post I shall add commercial bank credit to the baseline VAR. Do positive shocks to the monetary base affect the quantity of commercial bank credit? And does the amount of commercial bank credit have an effect on the output level and the price level? Tune in next time and find out. In this post we are going to going to enter two more currencies into the baseline VAR while including variables reflecting their individual monetary policies. In particular we are going enter the next two currencies with the largest relative weights in the Real Trade Weighted U.S. Dollar Index: Broad (TWEXBPA), namely the Mexican peso (11.9%) and the Japanese yen (6.9%). To estimate the real exchange rate (RER) of these currencies in terms of the US dollar I computed the ratio of the Bank for International Settlements (BIS) Real Broad Effective Exchange Rate for each currency area divided by the BIS Real Broad Effective Exchange Rate of the US. I term these ratios RERMXUS and RERJPUS. Here are the graphs of the natural logs of SBASENS and the real exchange rates. Using the Augmented Dickey-Fuller (ADF) and Kwiatkowski-Phillips-Schmidt-Shin (KPSS) tests I find that the order of integration is one for all three series. 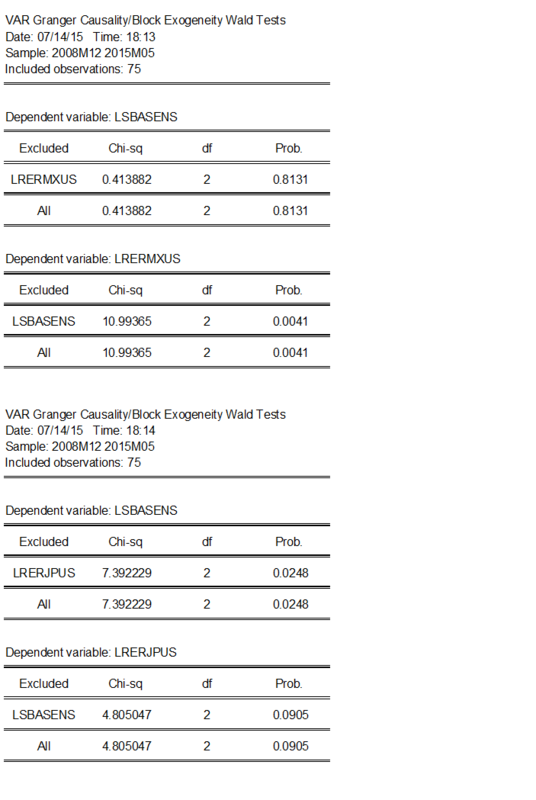 I set up two two-equation VARs in the log levels of the data including an intercept for each equation. Most information criteria suggest a maximum lag length of two for both VARs. The LM test suggests that there is no problem with serial correlation at this lag length in either VAR. The AR roots table suggests that the VARs are dynamically stable. The Johansen’s Trace Test and Maximum Eigenvalue Test both indicate that the US monetary base and RERMXUS are cointegrated at this lag length. Recall that if two variables are cointegrated this implies that there must be Granger causality in at least one direction between them. 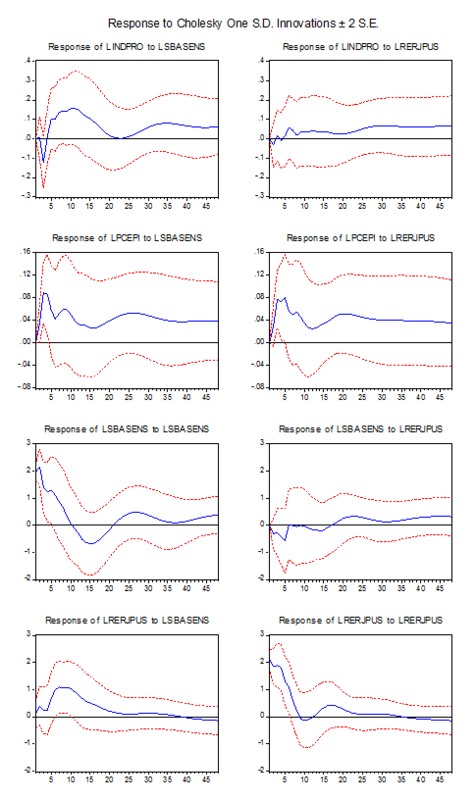 On the other hand the Johansen’s Trace Test and the Maximum Eigenvalue Test both suggest that that the US monetary base and RERJPUS are not cointegrated. Then I re-estimated the level VARs with one extra lag of each variable in each equation. But rather than declare the lag interval for the two endogenous variables to be from 1 to 3, I left the intervals at 1 to 2 and declared the lag of each variable to be exogenous variables. 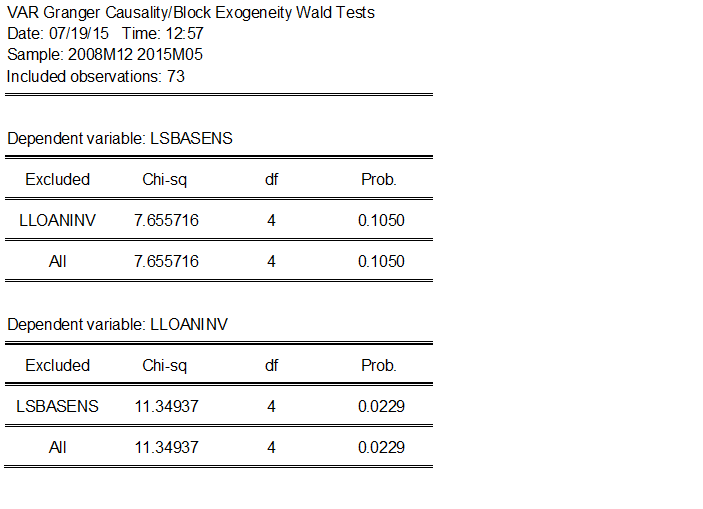 Here are the Granger causality test results. I fail to reject the null that the real exchange rate of the Mexican peso in terms of the US dollar does not Granger cause the US monetary base, but I reject the null that the US monetary base does not Granger cause the real exchange rate of the Mexican peso in terms of the US dollar at the 1% significance level. I reject the null that the real exchange rate of the Japanese yen in terms of the US dollar does not Granger cause the US monetary base at the 5% significance level, and I reject the null that the US monetary base does not Granger cause the real exchange rate of the Japanese yen in terms of the US dollar at the 10% significance level. In other words there is strong evidence that the US monetary base Granger causes the real exchange rate of the Mexican peso in terms of the US dollar but not the other way around, and there is evidence of bidirectional Granger causality between the US monetary base and the real exchange rate of the Japanese yen in terms of the US dollar. Since the US monetary base Granger causes the real exchange rates, they should probably be added to our baseline VAR model. This is because, under these circumstances, we might expect shocks to the US monetary base in the VAR model to lead to statistically significant changes in the real exchange rates. 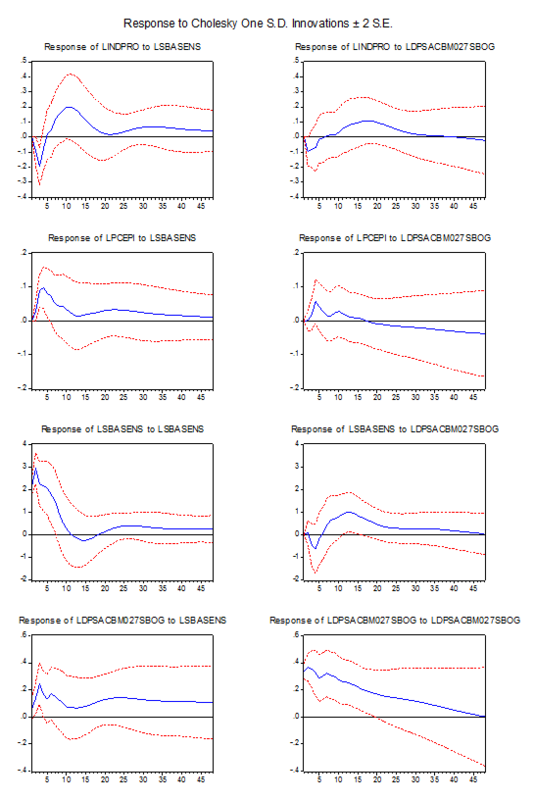 I am using a recursive identification strategy (Choleskey decomposition), which is the dominant practice in the empirical literature on the transmission of monetary policy shocks. Such a strategy means that the order of the variables affects the results. For the four-variable VARs I have been arranging the output level first, the price level second, the monetary policy instrument third, and the financial variable last in the vector. This ordering assumes that the Federal Open Market Committee (FOMC) sees the current output level and price level when it sets the policy instrument, and that the output level and price level respond to a policy shock with one lag, but that financial markets respond to a policy shock with no lag. In what I am about to do now, I was heavily influenced by Eichenbaum and Evans (1995). To reflect the interaction of the monetary policies of both the US and the foreign currency area, I am going to add three more variables: the effective fed funds rate, the monetary base of foreign currency area and the effective overnight interbank rate of the foreign currency area. Following the practice of Eichenbaum and Evans, I am going to place the interest rate variable after monetary aggregate variable, and I am going to place the US monetary policy variables after the foreign monetary policy variables. Thus the order of the variables in the vector will be the level of industrial production first, the personal consumption expenditure price index second, the foreign monetary base third, the foreign effective overnight interbank rate fourth, the US monetary base fifth, the effective fed funds rate sixth, and the real exchange rate last. With the log of the Mexican monetary base, the Mexican bank funding rate, the effective fed funds rate and the log of the real exchange rate of the Mexican peso in terms of the US dollar added to the baseline VAR model, a majority of the information criteria suggest a maximum lag length of three. An LM test suggests that there is no problem with serial correlation at this lag length. An AR roots table shows the VAR to be dynamically stable at this lag length. The Johansen’s Trace Test indicates that there exists three cointegrating equations at this lag length, and the Maximum Eigenvalue Test indicates that there are four. In any case, this is expected, since we already have evidence that the US monetary base is cointegrated with both industrial production and the real exchange rate of the Mexican peso in terms of the US dollar. The matter of cointegration is addressed in greater detail in the three posts where the baseline VAR is developed. With the log of the Japanese monetary base, the Japanese call rate, the effective fed funds rate and the log of the real exchange rate of the Japanese yen in terms of the US dollar added to the baseline VAR model, a plurality of information criteria suggest a maximum lag length of either one or four. An LM test suggests that there is a problem with serial correlation at any lag length less than four. An AR roots table shows the VAR to be dynamically stable at this lag length. The Johansen’s Trace Test indicates that there exists five cointegrating equations at this lag length, and the Maximum Eigenvalue Test indicates that there is one. In any case, this is expected, since we already have evidence that the US monetary base is cointegrated with industrial production. As before, the response standard errors I will show are analytic, since Monte Carlo standard errors change each time an Impulse Response Function (IRF) is generated. Here are the responses to the US monetary base and to real exchanges rates in the seven-variable VARs. The instantaneous response of the real exchange rate of the Mexican peso in terms of the US dollar to a positive shock to the US monetary base is positive but statistically insignificant. This is followed by a statistically significant positive response in months two and three. Furthermore, a positive shock to the real exchange rate of the Mexican peso in terms of the US dollar in month one leads to a statistically significant positive response in the level of industrial production in months three through six. The instantaneous response of the real exchange rate of the Japanese yen in terms of the US dollar to a positive shock to the US monetary base is positive but statistically insignificant. This is followed by a statistically significant positive response in months six through ten. Furthermore, a positive shock to the real exchange rate of the Japanese yen in terms of the US dollar in month one leads to a statistically significant positive response in the price level in months three through five. The IRFs also show that a positive 2.5% shock to the US monetary base in month one leads to a peak increase in the real exchange rate of the Mexican peso in terms of the US dollar of 1.1% in month three. In turn, a positive 2.5% shock to real exchange rate of the Mexican peso in terms of the US dollar in month one leads to a peak increase in industrial production of 0.15% in month five. The IRFs also show that a positive 2.0% shock to the US monetary base in month one leads to a peak increase in the real exchange rate of the Japanese yen in terms of the US dollar of 1.1% in month seven. In turn, a positive 2.1% shock to real exchange rate of the Japanese yen in terms of the US dollar in month one leads to a peak increase in the price level of 0.089% in month three. Why do the Mexican peso and the Japanese yen appreciate with respect to the US dollar in response to a positive shock to the US monetary base? A positive shock to the US monetary base increases expected Nominal GDP (NGDP), or expected aggregate demand (AD), and higher expected AD means higher inflation expectations, ceteris paribus. This leads to an increase in the expected real exchange rates of the Mexican peso and the Japanese yen in terms of the US dollar. Why might an increase in the real exchange rate of the Mexican peso and the Japanese yen in terms of the US dollar lead to an increase in the US output level or price level? An increase in the real exchange rate of foreign currency in terms of the US dollar can make US goods and services more competitive with goods and services priced in that currency, both here and in that currency area, and it can raise the price of goods and services imported from that currency area, which may be reflected by an increase in the US price level. In my next post I shall add commercial bank deposits to the baseline VAR. Do positive shocks to the monetary base affect the quantity of commercial bank deposits? And does the amount of commercial bank deposits have an effect on the output level and the price level? GOP presidential hopeful Jeb Bush has generated some blog-blabbing on his pronouncement that the U.S. GDP could and should grow at 4% real annually. No doubt Bush has some good and some GOP ideas on how to get to 4% real growth, starting with cutting taxes on the rich and specific regulations disliked by GOP campaign contributors, although eliminating federal ethanol diktats or economically parasitical defense spending will never be mentioned. But Bush has another, even larger hurdle than partisan impediments to clear on his race to 4%: The Federal Reserve Board. Forgotten today is that the U.S. economy did expand by 20% in four years in recent history—the four years following the 1976 recession. Arthur “Print More Money” Burns was Fed Chief, and he thought U.S. inflation was baked into the cake, and so all he could do was promote growth. Burns got inflation too. It is easy to dismiss Burns, but in fact he faced an economy far more inflation-prone than today. Unions were huge, international trade was small, banking was rate-regulated, transportation was rate-regulated, telecommunications was rate-regulated. Even stockbroker commissions were regulated. Big Steel, Big Autos, Big Aluminum, Big Labor defined the economy. USDA dictated crop prices. The minimum wage was higher than today in real terms, top marginal tax rates were at 90%, and there was no Internet and its price-searching or market-making. So, when Burns stepped on the pedal, yes he pushed real growth north of 4% annually, but he did obtain double-digit inflation also. But as the intervening years have shown repeatedly, today the U.S. economy is not inflation-prone. Indeed, the Fed can print up $4 trillion in QE, and still fall below its too-tight 2% PCE target—a target less than half the rate of inflation Volcker called low enough. Jeb Bush: If you really want real 4% growth, think very, very carefully about who you appoint to the Federal Reserve Board. Monetary suffocation and 4% real GDP growth might happen, but it is doubtful. John Williams´ Oasis: A mirage! Nonetheless, I still expect inflation to move back up to our target over the next couple of years. With a strengthening economy, special factors dissipating, wages on the rise, inflation expectations stable at 2%, and, full employment right around the corner, I see all the factors in place to meet our inflation goal by the end of next year (see Nechio 2015). But the point of being data dependent is that information drives your decisions; and while my forecast looks great, I am wary of acting before gathering more evidence that inflation’s trajectory is on the desired path. In this post we are going to going to disaggregate LRERROWUS, which is essentially the additive inverse of the natural log of Real Trade Weighted U.S. Dollar Index: Broad (TWEXBPA), into separate currencies and enter them into the baseline VAR while including variables reflecting the individual monetary policies of their respective currency areas. A good place to start is by considering the relative weights of the currencies in TWEXBPA. The three currencies with the greatest weights are the Chinese renminbi (21.3%), the euro (16.4%) and the Canadian dollar (12.7%). To estimate the real exchange rate (RER) of each of these currencies in terms of the US dollar I computed the ratio of the Bank for International Settlements (BIS) Real Broad Effective Exchange Rate for each currency area divided by the BIS Real Broad Effective Exchange Rate of the US. I term these ratios RERCHUS, REREUUS and RERCAUS. The next thing I did was check to see if the US monetary base Granger causes the RER of these currencies in terms of the US dollar during the period from December 2008 through May 2015. Not only does the US monetary base not Granger cause RERCHUS, the p-value for the non-causality test is an amazingly high 99.15%. Of course the IMF has classified the exchange rate arrangement of China as a “crawl-like arrangement” (page 6) with a “de facto exchange rate anchor to the US dollar” (see footnote) since 2007. The Granger causality test result supports this classification, and in light of it, perhaps the exchange rate arrangement of China should really be termed a “crawl-like peg”. In any case, to do further analysis of RERCNUS I would need to know China’s monetary base and overnight repo rate, and personally I find the website of the People’s Bank of China even less user friendly than the Bank of England’s web site used to be. So I’ll leave it until a later date, and for now, based on the near 100% value of the above p-value, I’ll assume that the outcome of my efforts will end up in grim defeat anyway. So let us turn our attentions to the euro and the Canadian dollar, which are both classified as “free floating” by the IMF. 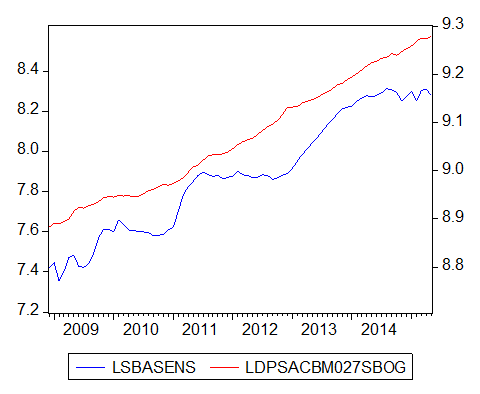 Here are the graphs of the natural log of SBASENS and the real exchange rates. Using the Augmented Dickey-Fuller (ADF) and Kwiatkowski-Phillips-Schmidt-Shin (KPSS) tests I find that the order of integration is one for all three series. I set up two two-equation VARs in the log levels of the data including an intercept for each equation. Most information criteria suggest a maximum lag length of two for both VARs. 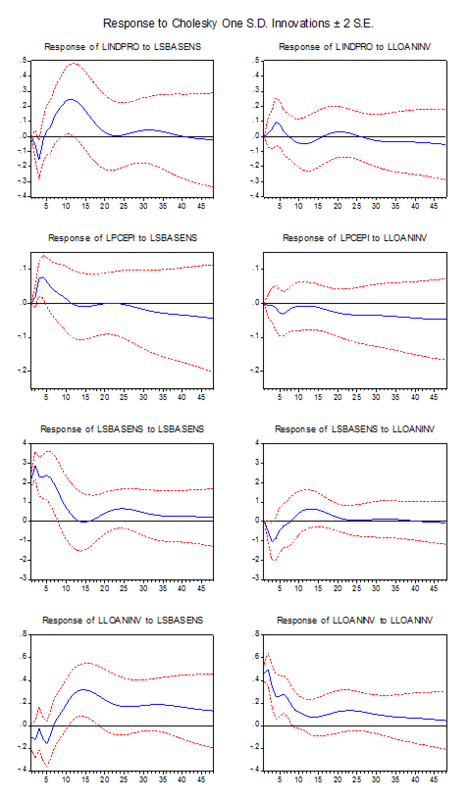 The LM test suggests that there is no problem with serial correlation at this lag length in either VAR. The AR roots table suggests that the VARs are dynamically stable. 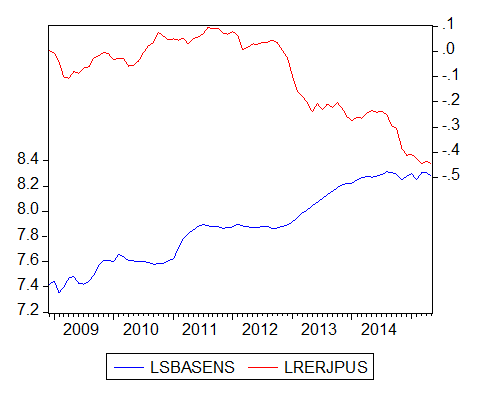 The Johansen’s Trace Test and Maximum Eigenvalue Test both indicate that the US monetary base and REREUUS are cointegrated at this lag length. 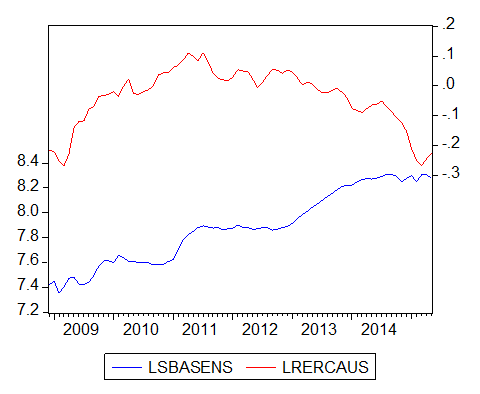 The Johansen’s Trace Test indicates that the US monetary base and RERCAUS are cointegrated at this lag length, but the Maximum Eigenvalue Test does not show any signs of cointegration. Recall that if two variables are cointegrated this implies that there must be Granger causality in at least one direction between them. I fail to reject the null that the real exchange rate of the euro in terms of the US dollar does not Granger cause the US monetary base, but I reject the null that the US monetary base does not Granger cause the real exchange rate of the euro in terms of the US dollar at the 5% significance level. I fail to reject the null that the real exchange rate of the Canadian dollar in terms of the US dollar does not Granger cause the US monetary base, but I reject the null that the US monetary base does not Granger cause the real exchange rate of the Canadian dollar in terms of the US dollar at the 1% significance level. In other words there is strong evidence that the US monetary base Granger causes the two real exchange rates but not the other way around. Since the US monetary base Granger causes the real exchange rates they should probably be added to our baseline VAR model. This is because, under these circumstances, we might expect shocks to the US monetary base in the VAR model to lead to statistically significant changes in the real exchange rates. 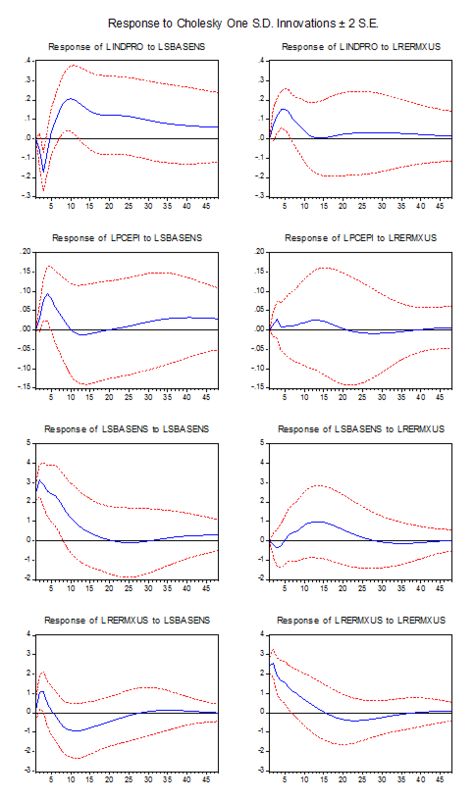 I am using a recursive identification strategy (Cholesky decomposition), which is the dominant practice in the empirical literature on the transmission of monetary policy shocks. Such a strategy means that the order of the variables affects the results. For the four-variable VARs I have been arranging the output level first, the price level second, the monetary policy instrument third, and the financial variable last in the vector. This ordering assumes that the Federal Open Market Committee (FOMC) sees the current output level and price level when it sets the policy instrument, and that the output level and price level respond to a policy shock with one lag, but that financial markets respond to a policy shock with no lag. With the log of the Euro Area monetary base, the Eonia rate, the effective fed funds rate and the log of the real exchange rate of the euro in terms of the US dollar added to the baseline VAR model, a plurality of the information criteria suggest a maximum lag length of either one or five. An LM test suggests that there is a problem with serial correlation at any lag length less than five. An AR roots table shows the VAR to be dynamically stable at this lag length. The Johansen’s Trace Test indicates that there exists four cointegrating equations at this lag length, and the Maximum Eigenvalue Test indicates that there are three. In any case, this is expected, since we already have evidence that the monetary base is cointegrated with both industrial production and the real exchange rate of the euro in terms of the US dollar. The matter of cointegration is addressed in greater detail in the three posts where the baseline VAR is developed. With the log of the Canadian monetary base, the Canadian overnight money market financing rate, the effective fed funds rate and the log of the real exchange rate of the Canadian dollar in terms of the US dollar added to the baseline VAR model, a plurality of information criteria suggest a maximum lag length of four. An LM test suggests that there is no problem with serial correlation at this lag length. An AR roots table shows the VAR to be dynamically stable at this lag length. The Johansen’s Trace Test indicates that there exists five cointegrating equations at this lag length, and the Maximum Eigenvalue Test indicates that there are three. In any case, this is expected, since we already have evidence that the monetary base is cointegrated with both industrial production and the real exchange rate of the Canadian dollar in terms of the US dollar. As before, the response standard errors I will show are analytic, since Monte Carlo standard errors change each time an Impulse Response Function (IRF) is generated. Here are the responses to the monetary base and to real exchanges rates in the seven-variable VARs. The instantaneous response of the real exchange rate of the euro in terms of the US dollar to a positive shock to the US monetary base is negative but it is relatively small and statistically insignificant. This is followed by a statistically significant positive response in month three. However, a positive shock to the real exchange rate of the euro in terms of the US dollar does not lead to a statistically significant response in industrial production or the price level in any month. The instantaneous response of the real exchange rate of the Canadian dollar in terms of the US dollar to a positive shock to the US monetary base is positive but statistically insignificant. This is followed by a statistically significant positive response in month two. Furthermore, a positive shock to the real exchange rate of the Canadian dollar in terms of the US dollar in month one leads to a statistically significant positive response in the level of industrial production in months five and six, and a statistically significant positive response in the price level in month two. The IRFs show that a positive 2.0% shock to the US monetary base in month one leads to a peak increase in the real exchange rate of the euro in terms of the US dollar of 1.5% in month seven. The IRFs also show that a positive 1.9% shock to the US monetary base in month one leads to a peak increase in the real exchange rate of the Canadian dollar in terms of the US dollar of 0.59% in month three. In turn, a positive 1.4% shock to real exchange rate of the Canadian dollar in terms of the US dollar in month one leads to a peak increase in industrial production of 0.10% in month six, and to a peak increase in the price level of 0.037% in month two. Why do the euro and the Canadian dollar appreciate with respect to the US dollar in response to a positive shock to the US monetary base? A positive shock to the US monetary base increases expected Nominal GDP (NGDP), or expected aggregate demand (AD), and higher expected AD means higher inflation expectations, ceteris paribus. This leads to an increase in the expected real exchange rates of the euro and the Canadian dollar in terms of the US dollar. Why might an increase in the real exchange rate of the Canadian dollar in terms of the US dollar lead to an increase in the US output level and the price level? An increase in the real exchange rate of a the Canadian dollar in terms of the US dollar makes US goods and services more competitive with Canadian goods and services, both here and in Canada, and it raises the price of goods and services imported from Canada, which is reflected by an increase in the US price level. For the sake of thoroughness, in Part 3 I am going to enter yet two more currencies into the baseline VAR while including variables reflecting their individual monetary policies.